1- Try the orange wine at Alvarito Peregil Taberna, (Mateos Gago Street, by the Cathedral) and after that, on the other side of Constitution Avenue, go to Bodega Morales, one the most ancient tabernas in Seville. Good wine and old andalusian taste. 2- Regina Street. The famous “Setas” or ” Mushrooms”(Metropol Parasol) gave place to a curious and lovely area of the city, with retro shops,mini markets, bars and an Antiquarium (roman ruins) to visit, but also to a full of life street: Regina St. It is located just behind the “Mushrooms” and it offers small libraries, teather on the street, ecologic shops and tapas bar with soul.At the end of this street starts the Feria street, that you shouldn´t miss if you want to enjoy the authentic face of the city! 5- Thursday mornings, go to the Feria Street to visit the street market “El Jueves” . You can find a little bit of everything, books, antiques, furniture, paintings… And after that, go to “la Alameda” which is very closed and enjoy the atmosphere of this area!! 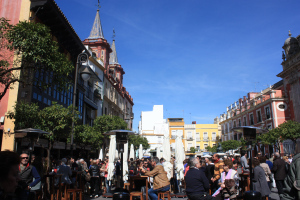 Seville is full of places to enjoy the city!